Rich buttermilk and vanilla bean cake in purple, yellow and green make these Mardi Gras cupcakes topped with Reese’s mini cupcakes the perfect party treat! In February 2012, AFN Bavaria here in Germany is hosted me for a 2 hour segment to talk cupcakes and baking! And, well… since it’s Mardi Gras season, I thought it’d be a perfect reason to bring the DJ’s some party cupcakes! Because I needed to color the batter, I needed a basic white cake batter to start with. So, I whipped up a simple vanilla buttermilk cupcake. But… you know me, nothing I do is ever basic. These cupcakes have my favorite Madagascar vanilla beans, buttermilk and some added sour cream for flavor. There is nothing basic about the flavor of these bad boys! I topped the cupcakes with a cinnamon cream cheese frosting then embellished them with Mardi Gras colored sprinkles and mini cupcakes made with Reese’s peanut butter cups. This is a simple, fun way to dress up your cupcakes for a party! You don’t just have to make these cupcakes for Mardi Gras either… they could be made in green and red for Christmas. They could be made in pink and white for Valentine’s Day or even Green for St. Patrick’s day. The possibilities are quiet endless! 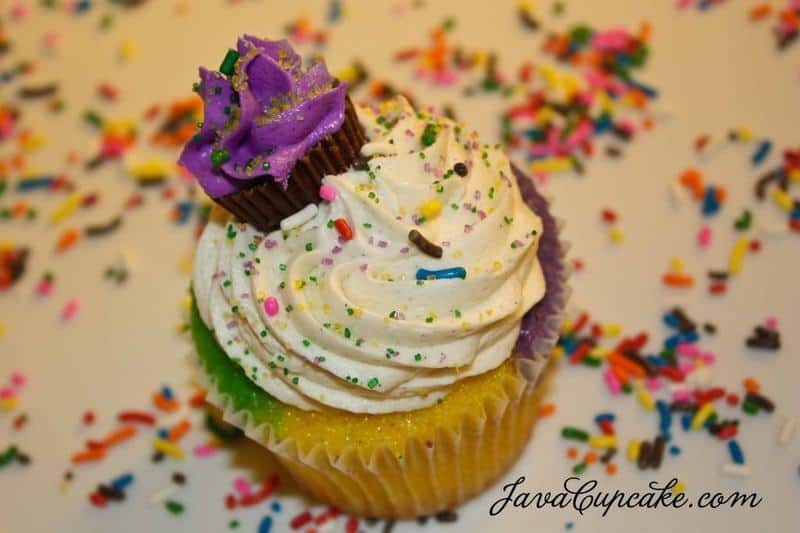 So, if you’re looking for a fun, simple, yet delicious cupcake to serve at your Mardi Gras party… make these Mardi Gras Cupcakes! They’ll be sure to impress your party guests! 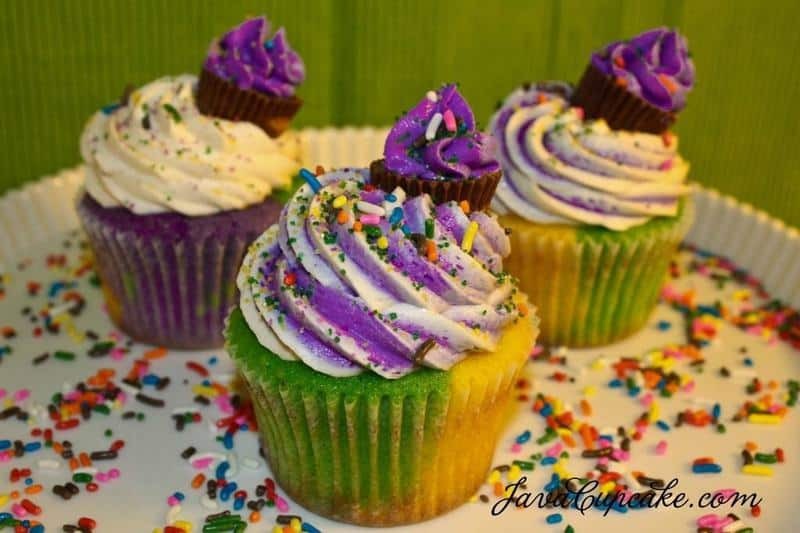 These cupcakes are ready to PARTY for Mardi Gras! Preheat oven to 350 F degrees. Line cupcake pans with white liners. While that is creaming, sift together the flour, baking powder and salt in a medium bowl. Set aside. In another medium bowl, whisk the eggs. Add the buttermilk, vanilla beans, vanilla extract and sour cream. Whisk until combined. It will look lumpy, which is okay. Add the wet mixture to the butter/sugar and mix on medium speed. Scrape the sides of the bowl and make sure everything is incorporated. NOTE: It will look curdled. DO NOT FRET! It will smooth out once you add the flour. Add all the flour at once and mix on low to medium speed until smooth. Don't over mix!! Separate batter evenly into three bowls. Add food coloring and mix until uniform in color. Using a tablespoon, scoop one color into the liner against one edge. Quickly, scoop the second color next to/overlapping the first color. Finally, add the third color. NOTE: By the time you get to scooping the third color, you should still be able to see a 1/3 of the bottom of the liner. Add another smaller scoop of each color until the liners are 1/2-2/3 full. NOTE: Do not fill these more than 2/3 full. They puff up nicely and you don't want overflow! Bake 18-20 minutes or until a toothpick comes out clean. Rotate pan after 12 minutes. Cool in pans for 7-8 minutes before removing to a wire rack to cool completely before frosting and decorating. In the bowl of an electric stand mixer, cream together the butter and cream cheese. /4lb at a time, add the powdered sugar. After the first addition, add the vanilla extract and cinnamon. Beat until smooth. After the next additions of powdered sugar, add whipping cream and beat on high until smooth. After the last addition of sugar, add enough cream until you get your desired consistency. Add the pinch of salt and beat on high for 5 minutes. Reserve 1/2 cup of frosting and tint with purple food coloring gel. Put it in a piping bag with a small star tip. Set aside. Using the white frosting and a large star tip, pipe a swirl of frosting on top of each cupcake. Embellish with sprinkles and jimmies. Place a Reese's cup on top of each cupcake, off center. I love what you did with these cupcakes. They look amazing. I love the colors you used and the toppings. Beautiful! How did you get the white frosting to have a purple stripe, or is that just my eyes playing tricks? Just added a little bit of purple frosting to the bag of white frosting when piping! 🙂 It creates that super cute effect! Oh my gosh!! I can’t believe you left a comment on my blog – You are like a celebrity in my book from Cupcakes Take The Cake. Ha ha. I didn’t know you had other blogs too! Thanks for making my day! 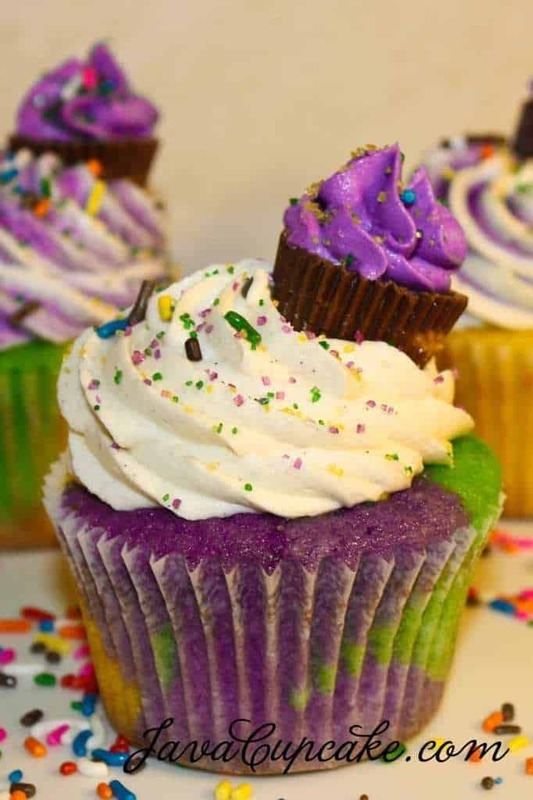 I love these Mardi Gras cupcakes and I am saving this for next year. Delicious cupcake themselves, made the cinnamon cream cheese frosting and it didn’t set up the way I liked so I just used a cinnamon buttercream. Super cute. Excellent! They look so good and i’m going to try them very soon. What do you use if you don’t have the vanilla beans? Thank you for the reply and can’t wait to make them. Love the little cupcake perched on top – such fun! I made these cupcakes & featured them on my blog. They were delicious! I did have some issues with the consistency of the frosting…I ended up putting it into the refrigerator to stiffen it up a bit. Thank you for sharing this recipe…I’ll definitely be back! Festive, delicious looking and oh my that buttercream! Plus a bonus pb cup! I am loving the colors and flavors going on these cupcakes. They are perfect for Mardi Gras! The “cupcake” on the cupcake is such a cute touch! Love love love! I just made my 1st batch of these and they are a resounding success WITHOUT frosting! Can’t wait to hear the response when they are frosted. I am baking and freezing them as I need 6 dozen for an event in two weeks. Much easier to make ahead so I only have to frost right before the event. Thank you! Quick question – what are the Rolo candies for? They are listed in the ingredients but I don’t see them in the directions. An alternative to the PB cups? Hi Lisa- I honestly don’t know why it said Rolo’s in the recipe. HA! Thanks for catching that error. You could use Rolos I suppose, but Reese’s are better!! Happy Baking! What’s up,I check your blog named “YouTube” like every week.Your writing style is witty, keep doing what you’re doing! And you can look our website about proxy list. I made these for a Mardi Gras party at a senior residence home and they all loved them! They are so pretty and festive and have a wonderful taste. I love how light the cake is! I will definitely be making these again. Thanks so much for sharing your recipes!